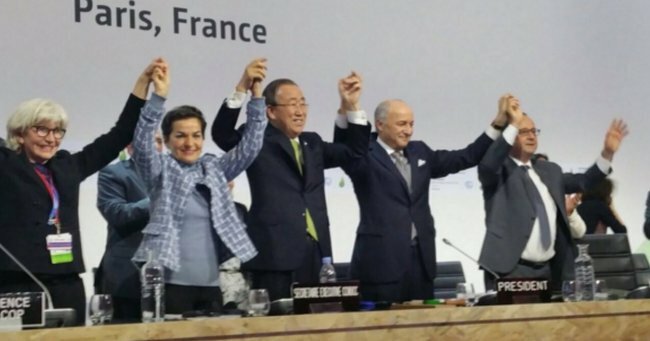 Why the UN Climate Agreement is a big deal. The UN climate agreement is a big deal. In 2005, I was a delegate at the UN climate change talks in Montreal. Ten years later, the world finally has a legally binding agreement aiming to limit global warming to 1.5 degrees celsius by the end of the century (quick recap: burning fossil fuels has already warmed the world an average of 1 degree celsius over what temperatures were before the Industrial Revolution, causing those once-in-a-hundred year type extreme weather events to become the new normal). This agreement is a big deal. Even before the commentary from news organisations, I could tell from my Facebook feed how significant it was. Post after post from climate campaigner friends (not generally known for false cheer) was full of joy, hope and celebration. “Go humans”. “This is a historic moment.” “End of the fossil fuel era”. Watch Waleed Aly break down the climate change debate on The Project. Post continues below. Of course, the agreement isn’t perfect. It comes about three decades later than was needed for the Pacific Islands to have a real shot at survival. It focuses on the amount of fossil fuels a country uses, rather than the amount they produce. And no piece of paper – even one signed by every Government in the world – changes the world on its own. But it’s a huge step forward for two reasons. Firstly, the deal gives us an ambitious number – limiting warming to 1.5 degrees celsius – to hold Governments to account. Anna’s son Robbie. Image: Supplied. Secondly, financial experts widely agree that the deal sends a very strong signal to markets and investors that the era of fossil fuels is over. Nigel Topping from the We Mean Business coalition calls the agreement an “historic economic catalyst”. Other economists (like my husband, who runs Australia’s first fossil fuel free superannuation fund) are using similar language. There’s no excuse now for funds managers to favour coal, oil and gas. It’s clear they’re part of the old economy. The future is renewable. This agreement talks about 2050 as the deadline for the world to achieve net zero carbon (in real person language: the world will be polluting less carbon into the atmosphere than we’re absorbing in carbon sinks like forests). My son Robbie will be 35 then. 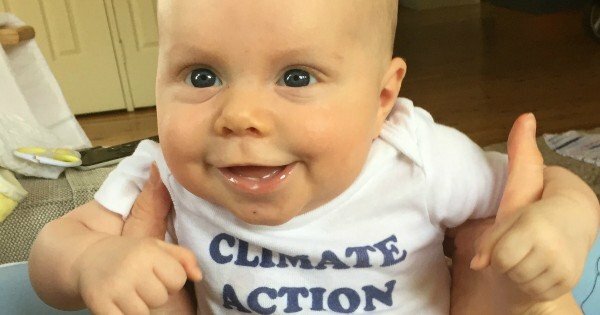 The decisions our Government makes in the next few years – about whether to support or hinder new coal mines and coal seam gas licences, for example – will define the future he grows up in. 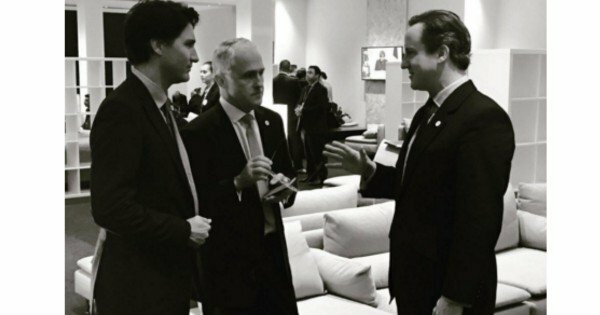 Prime Minister Malcolm Turnbull discussing climate change in Paris with Canadian Prime Minister Justin Trudeau and British Prime Minister David Cameron. Image via Instagram @turnbullmalcolm. The targets our Government set to reduce carbon pollution, or a UN deal negotiated on the other side of the world, might not sound like they matter to our daily lives, but trust me: they do. They’ll determine whether our children can enjoy the same fresh, safe food and healthy outdoors lifestyle that we did as kids. They’ll define the risk of our little ones being victims of extreme weather like heatwaves, bushfires and extreme drought. So this week, when you hear the words “climate change”, you have my permission – as a seasoned climate campaigner – to feel hopeful rather than depressed. It took 20 years of negotiations to get to this global agreement (which is ridiculous, I know – but remember we are up against the most powerful industries in the world). We don’t have another 20 to waste before we get serious about keeping coal, oil and gas in the ground. Let’s turn this agreement into reality.